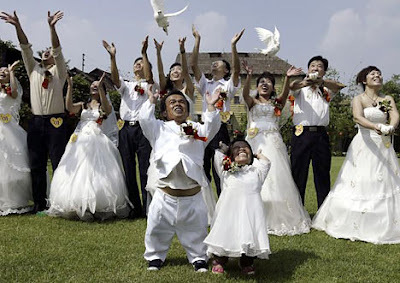 This is no tall story – standing at just 3ft 6ins, groom-to-be Li Tangyong swept his 2ft 3ins fiancee off her feet at a mass wedding ceremony rehearsal in China. The 33-year-old was all smiles as he scooped up the love of his life, 28-year-old Chen Guilan. 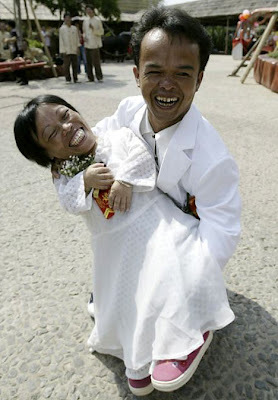 The pair were taking part in a rehearsal with 21 other couples in the Guangdong province of China. Next post SUMPAH GOKLIL ABISS !!!! HEWAN hewan lucu !!! 8 Proyek Pembangunan Terlama di dunia !!! Unik nya Gambar Hati Terbesar di Alam !! !